Already in November I celebrated Christmas the Scandi way with the book club. It’s a nice little tradition and this year we outdid ourselves with carol singing! It was so much fun and the perfect way for me to get into the Christmas spirit. We started the evening with the loveliest mushrooms salad on crostini, plenty of prosecco and my epic Christmas playlist. Then we moved on to the main meal of Jansson’s frestelse (grated potato baked with onions, anchovies and cream), two types of meatballs, a salad with pear and walnuts and this kale and almond quiche with Swedish Herrgård cheese. 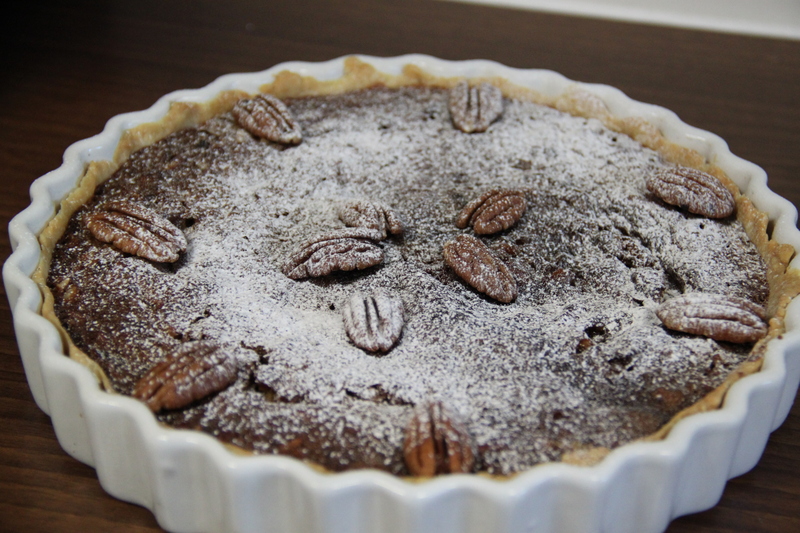 But the pièce de résistance was Mary-Louise’s pecan and almond pie for pudding. So lovely and timed well as it was around Thanksgiving! Pinch the pastry together and coat a pie dish with it. Use a fork to make small holes in the pastry. Pre-bake it for 10 minutes in 180C. Leave to cool. Squeeze the water out of the kale and chop it. Add salt and pepper to the kale and place in the the tin. Scatter with almond slivers and add the cheese. Beat eggs, cream and milk. Add plenty of salt and pepper. Pour into the tin and press the filling down so it’s all covered with the egg mixture. Bake in 180C for about 40 mins (until set and golden brown). I made this Thanksgiving pie the year before last and lots of times before then, but haven’t found the time (in the busy period between Thanksgiving and Christmas) to blog about it. So here it is, in January, but it’s still worth making it – apart from being a Thanksgiving staple dessert it’s also a wonderful winter pie. The recipe is courtesy of The Hummingbird Bakery Cookbook (the bakery’s first, and in my opinion also the best, cookbook). Adapted from The Hummingbird Bakery Cookbook. Add 1 tbsp water and beat until well-mixed. Add a second tbsp water and beat until you have a smooth dough. Wrap in clingfilm and leave to rest for an hour. Roll out on a floured surface and line the pie dish, trimming the edges. No need to blind bake. Save the 10-12 nicest pecans for decoration. Chop the rest. Add sugar, syrup and salt in a large saucepan and place on medium heat. Bring to the boil, then remove from heat and let cool slightly. Beat the eggs in a bowl. Add the warm (not hot) sugar mixture and stir it in swiftly (to avoid scrambling the eggs). Add butter and vanilla and stir until the butter has melted and been incorporated. Place the chopped pecans in the pie case and pour in the sugar mixture. Arrange the saved pecans carefully on top. Bake for 50-60 minutes, until a dark golden colour and slightly crunchy on top. Leave to cool and serve while it’s slightly warm with vanilla ice cream or whipped cream. Yesterday my American friend Laura invited a group of us over for an early Thanksgiving feast, since she will be spending the holiday back in the States with her family. 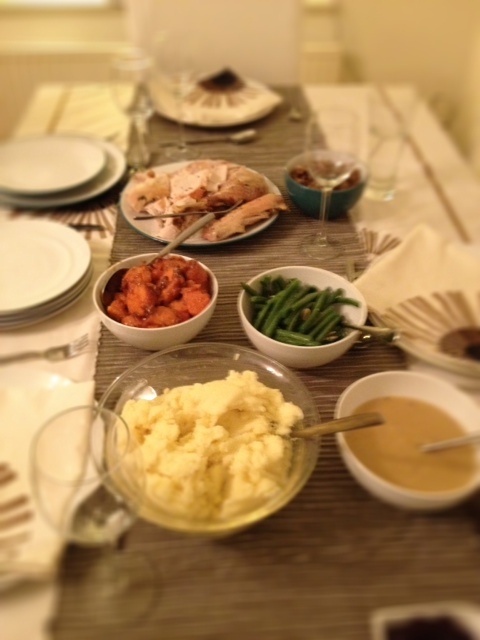 She went all out with the food, so we had turkey (of course), fluffy potato mash, candied sweet potatoes (yu-um! ), gravy, cranberry sauce and stuffing. It was really nice and we all had too much, which seems obligatory on this occasion. 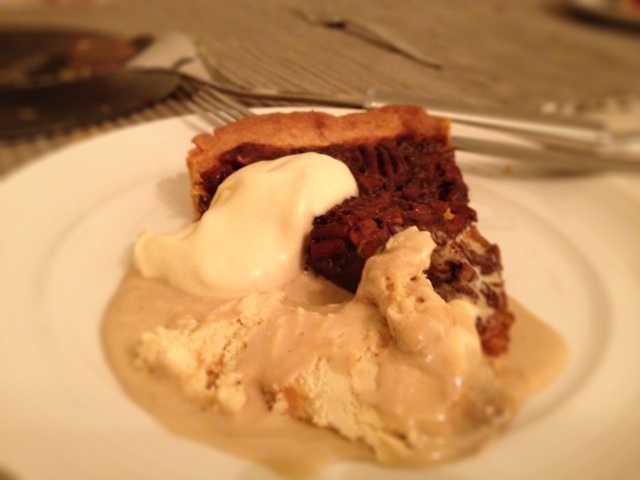 After a little break we were ready for a fabulous pecan pie, served with both brandy cream and honey comb icecream. So yummy! Thanks, Laura!